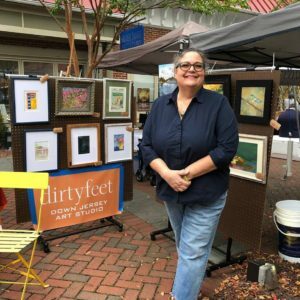 It’s Not Over Yet | Haddonfield Farmers Market ~ Celebrating our 13th Season in 2019! The season is winding down but that doesn’t mean there isn’t more to discover at the market! Just last Saturday the market featured our first ever artist’s walk, with six area artists displaying their beautiful, one of a kind, creations to admire and purchase. The artists work in all types of media including oils, acrylics, print making, ceramics, resin, wood and fabric. Check out their bios/contact information on our Farmer’s Market website and social media to order yourself or a loved one, a special something today. New to the Market…and Haddonfield, was National Picnic. Owner/Designer Betsy Cook, makes stylish, small batch women’s clothing right here in downtown Haddonfield in her studio boutique. Stop by the studio this weekend, Oct 13-14 for their Grand Opening with free gifts w/purchase, prize drawings and refreshments. was pleased to see two recurring vendors this week, Life Sanctuary, with brother/sister duo Jill and Michael presenting their elegantly crafted mason bee houses, jewelry, accessories, painted furniture and other home décor. I am particularly enamored with Jill’s felted wool mermaids (what girl hasn’t dreamed of being one? ), and Haddonfield’s own The Secret Garden, featuring a half dozen varieties of their delicious and oh so good for you, fresh fruit and herbal Kombucha. Available to drink on the spot or to take home in 16 ounce glass bottles. In case you were wondering if there was any food…there was plenty! Susan at Café Fiore was whipping up her signature breakfast sandwiches and other delights, Respond Bakery had a splendid display of their yummy baked goods to purchase and sample, the smell of the rotisserie at La Fonda de Teresita was in the air, for tacos and quesadillas, handcrafted gourmet pizzas were in the oven, guacamole was being freshly made, and much more! Is your mouth watering yet? I know mine is. There was a plethora of pumpkins at Blenheim Natural Produce (courtesy of Duffield’s), along with late season cherry tomatoes, green beans, fresh herbs, tomatillos and some beautiful Swiss chard. Both Sorbello Girls and Sara’s offered a dazzling bounty of fresh produce, from of apples to yams. I picked up apples for a pie, cranberries, baby spinach, butternut squash, and a huge, creamy white head of cauliflower to try to recreate one of my favorite Indian dishes with. This coming Saturday is Fall Festival in Haddonfield and our final Market of the year, featuring the ever-popular scarecrow making with the fabulous (and former market blogger), Jane Martin. So be sure to join us to stock up on freshness, have a bite to eat, enjoy the live music and the company of friends and neighbors, and for fun for the entire family! I’ll see you next week at the market! There's always something. You will just need to show up to find out for sure. This season we'll be having entertainment, hosting master gardeners, cook offs and much more! A special thanks to Becky Elmuccio and Ralph Ciallella for providing the photos for the website. 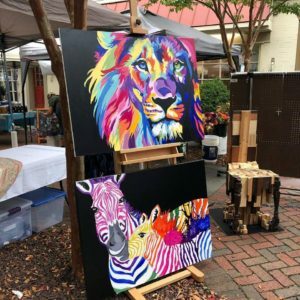 Haddonfield Farmers Market is located at Kings Court In the center of Historic Haddonfield, New Jersey!